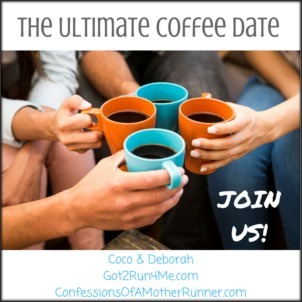 I’d tell you that I’m excited to see both of our fabulous coffee date hosts tonight at a pre-race dinner hosted by Deborah. Even though I’m not running the Cherry Blossom Ten Miler this year, Deborah was so sweet to invite me! I ran the race five times several years back when it wasn’t so crowded. In fact, you could register as late as a month before the race, park just a couple of streets over from the starting line, and pick up your packet mere minutes before the race started. I ran my 10-miler PR at this race in 1998 and if you’re interested in reading what the race was like back in those easy-peasy days, you can check out my recap here. 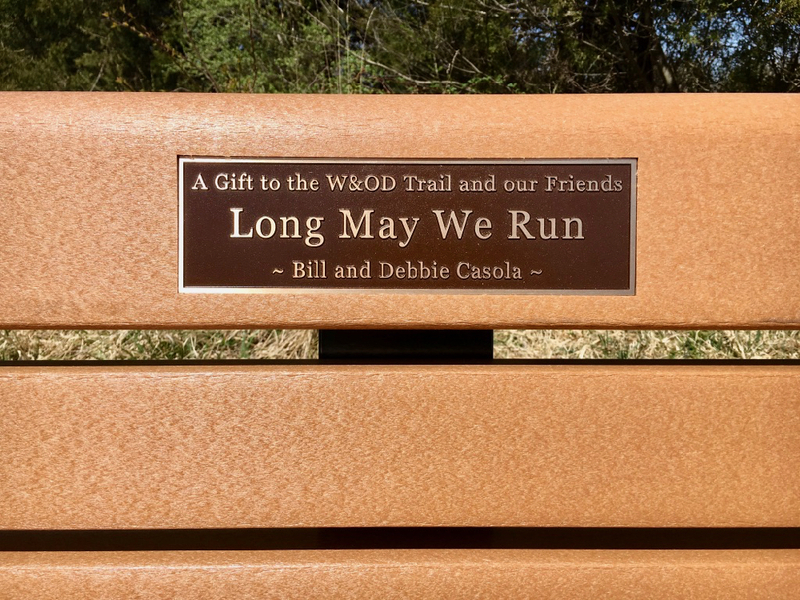 I’d tell you that the bench that Bill and I donated to the W&OD Trail was put in place on Monday or Tuesday. I ran past our selected spot on Saturday and even took a picture in front of the marked spot. I’d tell you that on February 25th contractors ripped apart our master bath for a complete remodel. Bill and I were displaced from both our bathroom and bedroom and are still living in what feels like slightly controlled chaos with our clothes and other belongings spread out in the three other bedrooms and baths. I’d tell you that work has been fabulously busy and between work and acting as the general contractor of our bathroom remodel, I’ve hardly had time to breath. As a result, other than my coffee linkups, I’ve only had time to write one blog post per week during the last two months. I really want to get back to my old blogging habits. Funny thing, as I’m typing out this post, my shoulders are starting to ache because I spend so little time typing these days. I’d tell you that last month I totally blew it when I said I’d won this adorable ornament when I entered a contest on a blog, and gave credit to the wrong blogger! I was mortified when I was teased about my mistake and want to set the record straight. Thank you, Lisa, at TechChick Adventures for the opportunity to win this ornament that I coveted when I saw it on your blog last year. I’d tell you that I still haven’t gotten on my bike outside (perhaps this weekend? ), but I’ve been giving my spin bike (affiliate link) lots of attention! 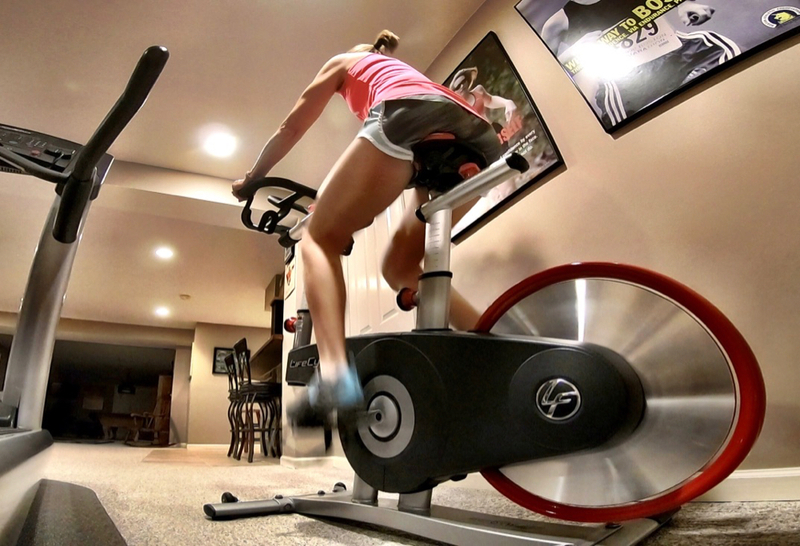 I’ll be the first to admit that I don’t do tough online spin classes while riding. I’m more of a steady pace with pickups rider. 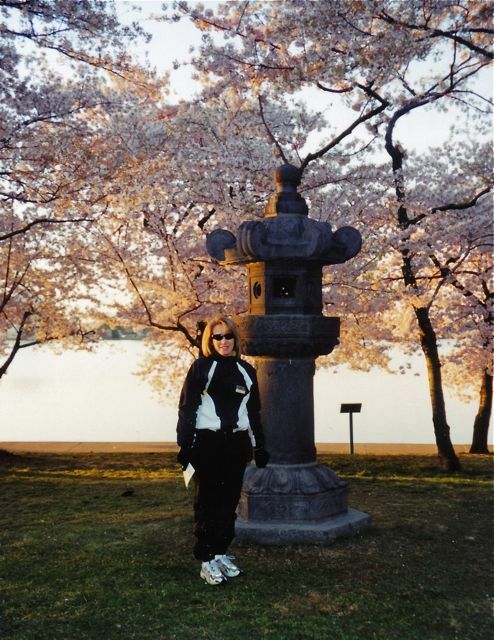 Have you visited DC to see the cherry blossoms? Is it spring in your neck of the woods? ~ Flowers and trees are finally blooming here! Feeling all the FOMO about the Cherry Blossom 10! I did have a bib but gave it away. Between RA and life, I just couldn’t get it together. Enjoy the meet up! Busy is good! Even if it means blogging less. It’s all good! Oh, bummer about having to give up your Cherry Blossom bib; another time for sure! I plan to go back to Chicago for the Club Industry Conference next fall (2020) so we’ll have to make something happen then. I’m excited to finally meeting you this weekend, hanging with running/blogging/girl friends, and seeing all the cherry blossoms !!! Can’t wait! See you soon! Same, here, I’m really looking forward to seeing you this evening! The bench is near mile marker 28. We’ll have to plan another group ride out this way this summer. 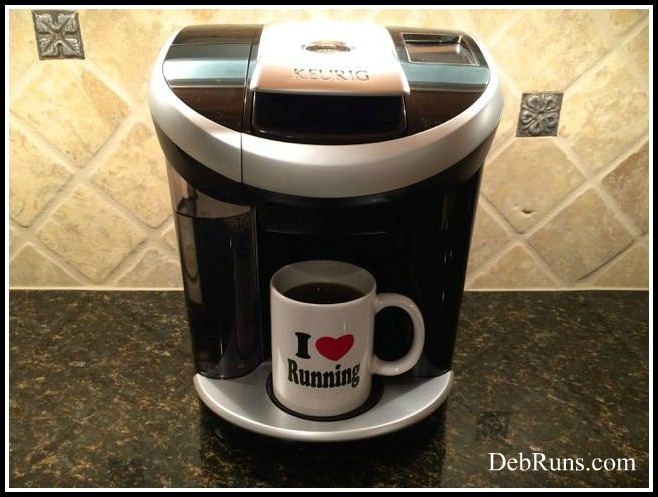 Oh, I’m not racing – as I mentioned, Deborah was so sweet to invite me even though I’m not running! 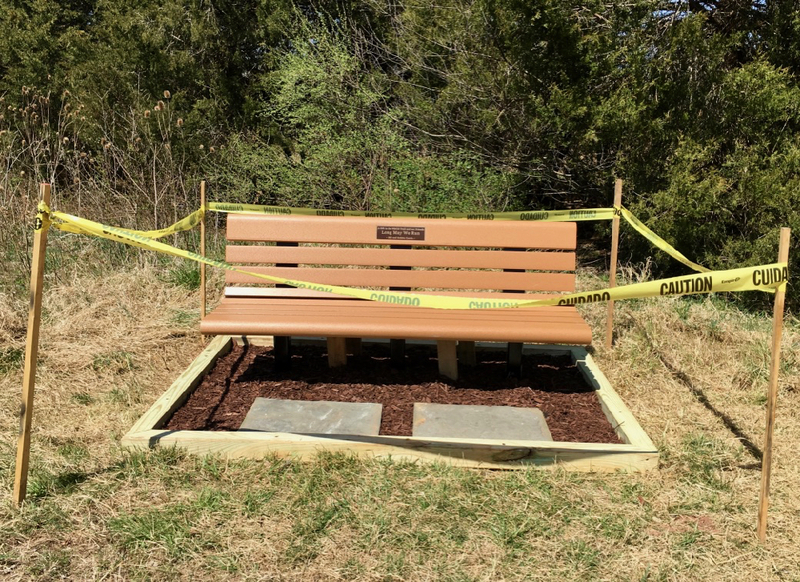 That was sweet of you to mention the mix up 🙂 That is so awesome that you have a bench on the trail!! 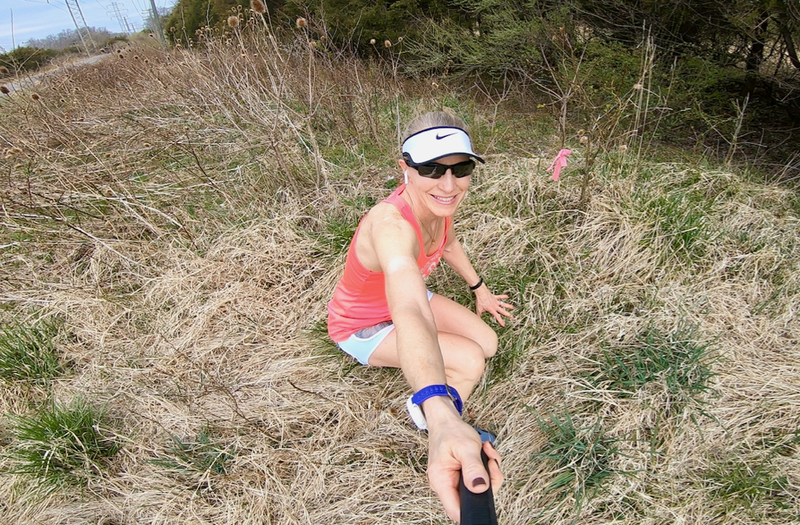 My husband always says that he would donate a bunch of money to add a drinking fountain to our favorite “long run” trail because there is nothing along the 9 miles that it stretches. On summer runs, it can get pretty hot and dry out there! At least there is a pit toilet, but from his stories, it sounds like he never quite makes it there. (haha TMI) . Have fun at the pre race dinner!! The pre-race dinner was so fun and the ladies are every bit as sweet in person as they seem on their blogs! I have to admit to just a touch of jealousy of all you girls meeting up at the Cherry Blossom. I haven’t run it in years, but I always loved that race. I got free entry to it a few times through a friend who was a radio personality and had extra free entries. We used to go to the Kennedy Center for brunch after the race, which was a total splurge, but so worth it! I also remember parking close to the race start and hiking over to the pre-race area. Your bench is so cool! I hope you get a chance to test it out this weekend. Oh, I’ve never eaten at the Kennedy Center, but it sounds like the perfect place to go after the race.